If you would like to help promote this book, please print a copy of this flyer (pdf) and post it on the bulletin boards of your office, school, church, synagogue, mosque, community center, local coffee shop. Thank you! The story of the Dominican Sisters of St. Catherine of Siena speaks of enduring struggle over more than a century to the present moment; it speaks of love triumphing over hate, forgiveness over revenge, and hope and courageover despair, poverty, and ignorance. It is a story that begins with a small group of women of diverse Catholic and non-Catholic traditions (Chaldean, Latin, Syriac, Orthodox, Armenian, and Nestorian) forming a Dominican community together and persevering to create their own native Iraqi congregation. It is an unfolding story of faith-filled women drawn by love of God into selfless sacrifice and service as unwavering witnesses of love in the midst of poverty, violence, and chaos. 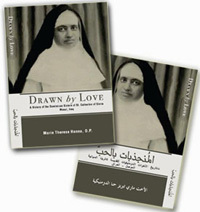 Written by former Prioress Marie Therese Hanna, OP, a former Prioress of the Congregation, Drawn by Love is the first published history of the Congregation since its founding in 1877. 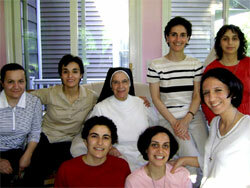 The 280-page book tells their story in English and Arabic, with 20 pages of photographs and a map (pdf) illustrating the Sisters’ mission areas. View a short video with excerpts of a presentation of Drawn by Love given in Adrian, Mich., by Sisters Aman Miriam Mansoor, OP, Elise D. García, OP, Aneesah McNamee, OP, and Joanne Screes, OP. Thanks to support from the Federation of Dominican Sisters USA, Hilton Fund for Sisters, Kalliopeia Foundation, and other funders, all proceeds from the sale of the book will be placed in a fund to support the higher education of young Iraqi Dominican Sisters studying abroad. These young Iraqi Dominican Sisters studying in the U.S. are preparing themselves to return home, equipped to introduce peace studies in their schools, Montessori training for their teachers, pastoral care and theology programs, and to provide psychological and medical care to their people. The Congregation is steadfastly committed to their mission of helping to shape a better future for Iraq and all her people. The education of their young Sisters for that purpose—in peace studies, medicine, pastoral care, psychology, theology, and other fields—is a key aim toward fulfilling that mission. If you would like to provide additional support to the fund, please donate here. Thank you! The missile hit the novitiate wing of the Motherhouse, where the three windows on the left are located. On July 22, 2003, at 1:30 a.m., while everyone in the Motherhouse was sleeping, a missile hit the wing of the Novitiate where three postulants were asleep. The bomb shook the entire building, shattering all the windows. 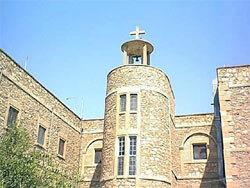 The novice director, Sister Huda Khuder Shitou, O.P., called the terrified novices and postulants out of their rooms into the hallway to guide them down to the basement. The power was out. Someone used a flashlight to guide the way. A few of the young women who had been unable to find their shoes in the dark followed barefoot, stepping over shards of broken glass. 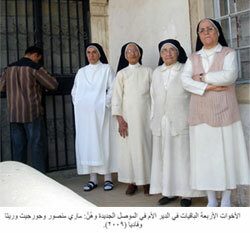 Four Sisters insist on remaining as a presence at the Al-Jadida Motherhouse in Mosul, living behind blocked-in windows and doors. Thanks to divine care, none of the Sisters was injured by the bombing; only the building sustained damage. It was the first of many attacks on the Motherhouse over the ensuing years.